We are pleased to announce that the second round of the CLIFF-GRADS program is now open! Students from developing countries currently enrolled in PhD programs are invited to apply for short-term scientific training and research stays on topics related to the measurement and management of greenhouse gas emissions and carbon storage in agricultural systems. Selected students will be sponsored in the amount of 10,000-12,000 USD for short-term (4-6 month) scientific training and research stays to collaborate with projects associated with CCAFS and GRA. Specific topics will depend on student and host institution scientist interests. A list of projects seeking to host students is included on the CCAFS CLIFF-GRADS webpage. The grants will be used to support living and research costs at the host institution. Grants may not be used for tuition or unrelated personal expenses. CLIFF-GRADS is a joint initiative of the CGIAR Research Program on Climate Change (CCAFS) low emissions development flagship and the Global Research Alliance on Agricultural Greenhouse Gases (GRA). CLIFF-GRADS aims to build the capability of early career agricultural students in developing countries to conduct applied research on climate change mitigation in agriculture. CLIFF-GRADS integrates the GRA’s new Development Scholarship and the CCAFS Climate Food and Farming Research Network with the common goal of providing grants to graduate students to expand their knowledge and experience in quantification of agricultural greenhouse gases. Research projects are hosted by CCAFS and GRA members and partners. Funding for CLIFF-GRADS is provided by the Government of New Zealand and by the CGIAR Trust Fund and bilateral agreements in support of CCAFS. Deadline for applications: September 30, 2018. Improved ruminant genetics increase animals’ resilience to climate-related stresses, increases reproductive performance, and – in some countries – could achieve emission reductions of 11-26% per unit of product, according to a new practice brief written by scientists from the Global Research Alliance’s Livestock Research Group and the CCAFS low emissions agriculture flagship. 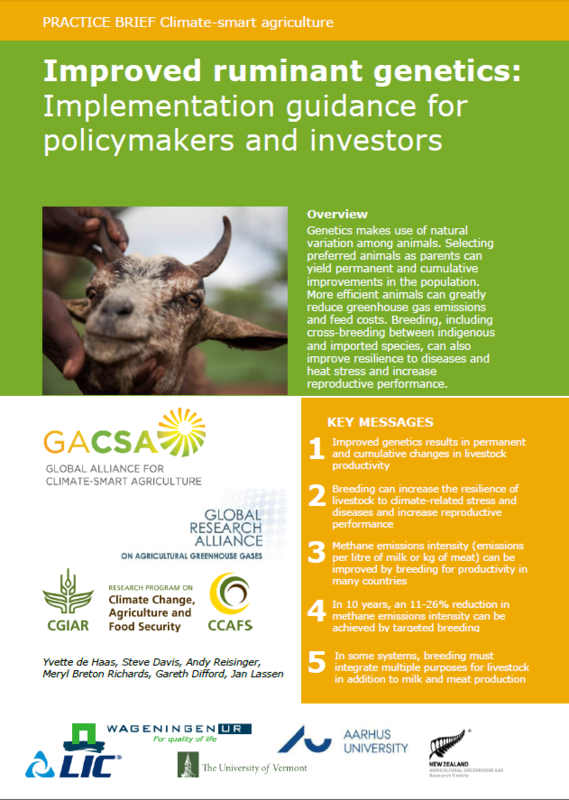 This brief is part of the CSA practice brief series of the Global Alliance for Climate Smart Agriculture (GACSA) Knowledge Action Group. The brief summarises the state of the science in this area and provides implementation guidance for policymakers and investors. It describes how animal breeding can increase livestock productivity and resilience to climate change, while also reducing greenhouse gas emissions intensity. It focuses on opportunities in developing countries, where the majority of the world’s ruminant populations can be found. More details on the practice brief can be found in a joint LRG/CCAFS blog post here. You can also download the practice brief here. The CGIAR Research Program on Climate Change, Agriculture and Food Security (CCAFS) has published a new analysis of what COP21 means for food and farming, and what the next steps should be between now and 2020 when the Paris Agreement comes into force. The analysis picks up the theme that “Voluntary cooperation” between countries, including through technology transfer and capacity building, is a major focus that comes through in the Agreement as is the need for all countries to support science and research. Read the CCAFS info note: The Paris Climate Agreement: what it means for food and farming http://bit.ly/1UpvXws. And for more information on research highlights visit CCAFS website: Paris Climate Agreement unlocks opportunities for food and farming http://bit.ly/1NsY1u9.